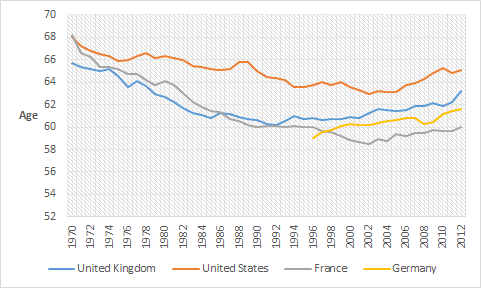 Average effective retirement ages by gender in the USA, UK, Germany and France, 1970 – 2012 | Utopia – you are standing in it! Source: OECD Pensions at a Glance. Figure 2 shows similar results for British and American women as for men in the same country shown in figure 1 . 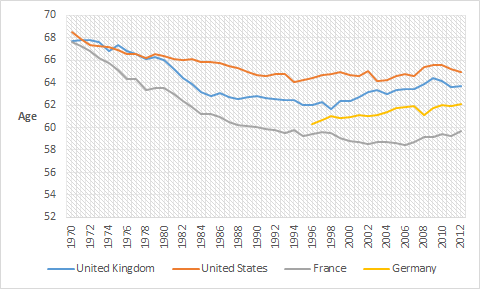 That is, falling effective retirement ages for both British and American women in the 1970s and 1980s followed by a slow climb again towards the end of 1990s. French effective retirement ages for women followed the same pattern as for French retirement ages for men – a long fall to below the age of 60 with a slight increase recently. The German retirement data suggest that effective retirement ages for German women is increasing. This entry was posted in economic history, gender, labour economics, labour supply, politics - USA and tagged ageing society, British economy, demographic crisis, economics of retirement, effective retirement ages, female labour force participation, female labour supply, France, Germany, male labour force participation, male labour supply, old age pensions, older workers, retirement ages, social insurance, Social Security, welfare state on July 25, 2015 by Jim Rose. Pingback: Average effective retirement age by gender in the PIGS, 1970 – 2012 | Utopia - you are standing in it!